LONDON, England (CNN) -- Britain experienced its heaviest snowfall in 18 years Monday, as adverse weather brought disruption to the transport network. 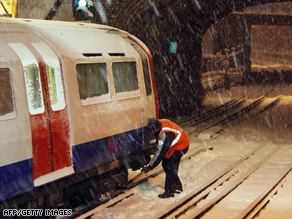 An underground worker attempts to release part of a tube train which had frozen in west London. London -- one of the world's leading financial centers -- was brought to a standstill as heavy snow shut down the city's bus network, partially paralyzing the city. Tens of thousands of commuters were advised not to make the journey into work in the British capital and hundreds of schools were closed across the country. Ryanair staff used loudhailers to tell passengers waiting at London's Stansted airport that no seats were available, as flights to and from the UK were badly hit, Britain's Press Association said. The airline asked travellers to be patient and said "abuse" of staff would not be tolerated. According to the British Airport Authority (BAA), which operates many of the UK's major airports, the adverse weather has caused significant disruption to airports in the south-east of the country in particular. London Heathrow: Reopened a single runway at 1100 GMT after both runways were closed, causing significant delays and over 650 cancellations to domestic and international flights. Cyprus Airways flight CY 332 from Larnaca exited the taxiway onto a grass area, having made a safe landing before the runways were closed. All passengers on board the plane were transferred by bus to the airport terminal. There were no injuries to any passengers. Gatwick Airport: Currently open but there are significant delays and cancellations. Stansted Airport: Runway was initially closed but opened at 0700 GMT -- significant delays and cancellations. Southampton: Reopened 1200 GMT - significant delays but hoping to open the runway mid-morning. Leeds Bradford: Has reopened runway but experiencing major delays. In Scotland, services to England from Glasgow, Edinburgh and Aberdeen airports are subject to delay or cancellation. On the trains, the extent of delays and cancellations to train services was not clear as the Web site of the National Rail Enquiries service "crashed" due to the huge volume of traffic it was experiencing. Eurostar services from London to Europe were experiencing severe delays due to heavy snow in both England and northern France. Domestic commuter services in the south of England were also badly hit, with the following rail companies experiencing delays and cancellations: Southeastern, C2C, First Capital Connect, First Great Western, London Overground, National Express East Anglia/Stansted Express , National Express East Coast Southeastern , Southern/Gatwick Express, South West Trains, Transport for London (which operates London Underground & London Buses) and Virgin Trains. On Monday, Britain's Highways Agency warned drivers in the south east of England to consider whether their journeys were completely necessary. Meanwhile, staff at the Agency's National Traffic Control Center in Birmingham, in England's West Midlands, warned that snow showers would continue to affect the east of the country throughout the morning. It added that its winter fleet, which consists of 500 salt spreaders and snow blowers, has already been used extensively this weekend, with regular salt spreading taking place to help keep the traffic moving. According to the UK Met Office, heavy snow showers will continue to affect many parts of England with the east, south east and trans-Pennine routes likely to be the worst affected. More persistent and heavier snow will spread north across central and eastern areas during the afternoon and evening.